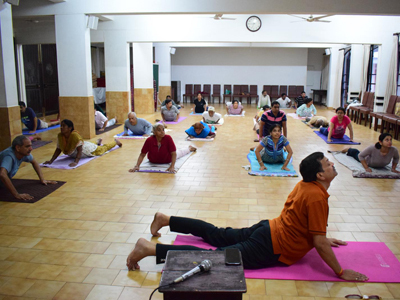 On December 27 to 31, 2018, Sri Aurobindo Centre for Homeopathy (SACH, a unit of Sri Aurobindo Society, Puducherry) organized a Yogasana and Pranayama Camp at the Society House, Puducherry, which was conducted by Yoga Acharya Gopalkrishna Dokania-ji, who has trained from from Munger (Bihar) School of Yoga. Yogasana and Pranayama enhance health and build immunity. Regular practice under proper guidance helps in prevention and management of diseases. Daily pranayama trains the lungs and improves the capacity of respiratory system immensely and positively affects autonomic nervous system which controls and governs essential functions of the body such as the heart rate, respiration and blood pressure, etc. Approximately 40 people participated and the response was very positive. Regular health enthusiasts as patients suffering of various illnesses and diseases were shown the path of better health with the practice of Yogasanas and Pranayama.